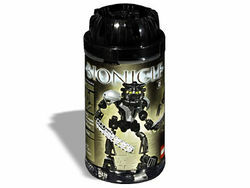 8566 Onua Nuva is a BIONICLE set released in 2002. He is one of the six Toa Nuva. He is armed with two Quake Breakers that can be attached to his feet to become all-terrain treads. He wears the Pakari Nuva, the Nuva Mask of Strength. He has armor on his body and shoulder plates covering his shoulders. In the BIONICLE Universe, he was a Toa Nuva of Earth and had remained silent when the Toa Nuva split up before the Bohrok-Kal were released on Mata Nui. Onua is the strongest Toa Nuva and has a realm similar to Pohatu's. The set is Onua's second appearance in set form. This is a description taken from LEGO.com. Please do not modify it. (visit this item's product page) The Power Lies Beneath! Wielding the power of the earth! Onua Nuva lives in the rocky tunnels deep beneath the surface of Mata Nui. His quake breakers make carving new passageways in the stone child's play, and when they are attached to his feet, they turn into high-speed, all-terrain tracks that get him wherever he needs to go! Turn the wheel on his back to move his mighty arms. Onua Nuva could transform into a Toa Nuva Kaita by combining Tahu Nuva and Pohatu Nuva with Onua Nuva. Facts about "8566 Onua Nuva"
Wielding the power of the earth! Onua Nuva lives in the rocky tunnels deep beneath the surface of Mata Nui. His quake breakers make carving new passageways in the stone child's play, and when they are attached to his feet, they turn into high-speed, all-terrain tracks that get him wherever he needs to go! Turn the wheel on his back to move his mighty arms.